Police hunting two convicted murderers who absconded from an open prison have released photos of the pair. Jason Croft, also known as Jason Fox, 28, from Salford and Michael Nixon, also 28, of Blackley, Manchester, left Sudbury Prison in Derbyshire last year. Both men were approaching the end of life sentences for murder, given in 1996, and had been given day release and home visits before they absconded. The men, who know each other, left on 31 October and 2 November respectively. Greater Manchester and Derbyshire police forces are working together to try to trace the two men. Derbyshire Police had earlier refused to release the photographs, although they said they were misquoted when saying pictures would not be released on Human Rights and Data Protection grounds. 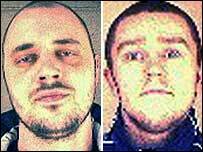 The new reason given by Derbyshire Police for not issuing pictures of the two absconders is that there was "no policing purpose" because the two men were not believed to be in their force area, but were thought to be in Manchester. The case is now being dealt with by Greater Manchester Police, who issued more details and photographs of the pair. He said he wanted "some explanation" as to why the images of the two convicts had not been put out. "When you are dealing with two convicted murderers, both of whom have absconded, it is utterly obvious that there is no public interest arising out of the Human Rights Act which prevents publication," he told the BBC. The Department for Constitutional Affairs (DCA) also said that the photos should be published if the men are considered a danger to the public. The department said the Human Rights Act "explicitly" allows police to print "wanted" pictures if it is in the public interest. It is not known whether they are together, but both are known to have links to the Salford, north Manchester and Middleton areas. More than 660 inmates have gone missing from Sudbury in the past 10 years. 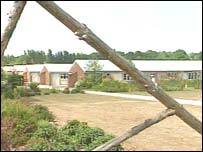 Croft and Nixon are among 13 inmates who have absconded from the prison in two months.